The reality of war has had a profound influence on my life. This influence is hard to see. In fact, it’s invisible. I would have kept it hidden if I hadn’t read Clay Sellers’ August 26 post, “Beyond the Clouds of War: A Faint, Silver Lining.” His writing inspired me to explore the complexity that a legacy of war has had on my life. I was born after my dad got back from fighting in the Pacific. He and his men took island after island, wresting the Pacific islands from Japanese soldiers determined to die fighting before yielding one inch of land. Pieces of metal bullets and shrapnel remained lodged inside my father’s body for the rest of his life. The higher-ups, however, didn’t exactly like what he said. The U.S. and its military went to war in Vietnam and my father was sidelined to a job far from the command structure he was a part of. The Vietnam war took our country on a long difficult journey. The protests about the war merged with the protests demanding civil rights and liberties. It was a chaotic and difficult time in this country. For my family, it was a tragic and painful time. We were torn apart as our political differences erupted. My brother, a helicopter pilot, was killed in combat; my sister’s husband was severely wounded. I served in the Marine Corps during the war and when I got out—naïve young woman that I was—I found it shocking to have students and protesters spit on veterans and call us “baby killers” along with many other, hideous epithets. My sister and I marched against the war before I buried my experiences and feelings deep inside. I rarely talk about these things; most of my friends don’t even know I am a veteran. Since Vietnam, circumstances have improved for veterans returning from our new wars in Iraq and Afghanistan. Today, veterans are more respected for the sacrifices they and their families make. But their wounds are real—both the visible and invisible wounds. 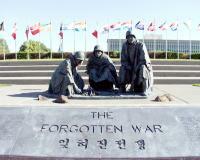 The consequences of war endure; societies and cultures need decades to recover. My husband survived a civil war in his country. He made it out of the war zone with his life, but his PTSD endures to this day. War has touched and wounded my family and my life more deeply than I can easily acknowledge—from my father’s service and the physical wounds he lived with, to my brother’s death and the remnants of metal in my brother-in-law’ body, to my husband’s residue of trauma. The pains are real and deep. The Coming Home Project is a nonprofit organization that supports returning veterans and their families. It was founded in 2005 by Joseph Bobrow, a Zen Roshi, who will be leading the October workshop with Sharon Salzberg, a vipassana teacher. I am curious to see if a Buddhist approach can help me heal from these deep and hidden wounds. Perhaps I can find a path to provide support to the veterans that are coming home to an economy in shambles; to a lack of jobs; to a paucity of healthcare and psychological treatment. I don’t know what to expect, but I am open to hearing from the veterans about their journey home from Afghanistan and Iraq. I’m surprised I’m writing this because I find it very difficult to openly acknowledge my own experience. It is also difficult to understand the reasons why war is so deeply embedded in human life or how our complex societal webs keep humans responding with violence to the problems and conditions of our world.